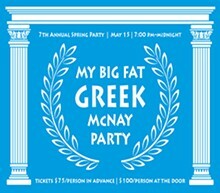 Join the McNay Art Museum and it's supporters for it's 7th Annual Spring Party. Don your best Greek Chic Attire or come dressed as your favorite god/goddess for a chance to win the costume contest. Greek delicacies and cocktails will be served, along with entertainment. There will be a silent auction, with items from the city’s best restaurants, boutiques, sports, and entertainment businesses. To purchase tickets, please call 210.805.1761.